Combined dry cell galvanic and faradic battery. 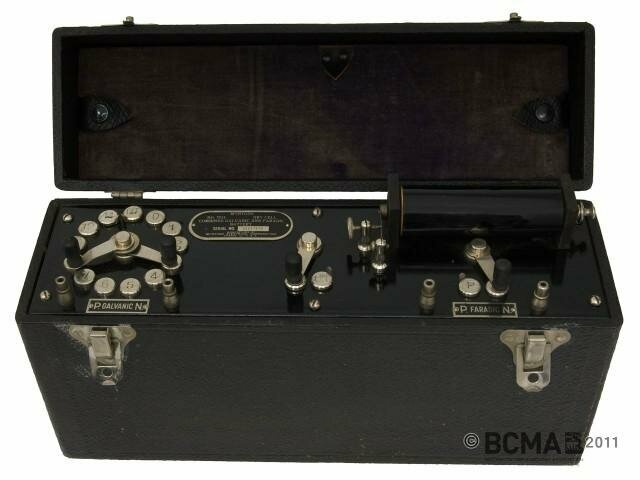 A medical apparatus consisting of a black leatherette covered steel hinged wooden case with textile covered steel handle and 2 catches. A velvet lined false lid attached by poppers covers a compartment which houses 2 felt pad electrodes with wooden handles, an electrolytic needle holder with a magnifying glass attached and 2 conducting leads covered in coloured woven cord. The mechanism (induction coil, etc.) is covered by a control panel displaying an oval plate giving the serial number , the model number  and manufacturer's details. Dimensions given are for closed case only. History of Use: Galvanic currents were used to create localised muscle contractions, to stimulate digestion or to remove or reduce moles, ulcers and tumors. The faradic currents gave a more powerful jolt to the body and was used as a nerve tonic or general stimulant. The electrolytic needle holder was used in the removal of hair.